Regulators want the Tier 1 Risk Based ratio to be a minimum of 4%, though there is talk of this going higher. 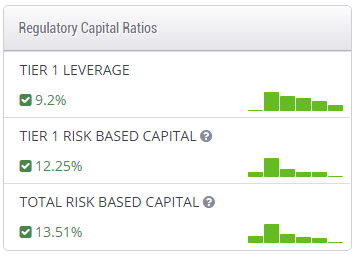 Banks showing a ratio below 4% (some say 6%) are deemed to be under capitalized. Tier 1 Capital plus Tier 2 Capital is the more common Capital Adequacy Ratio known as Total Risk Based and this number should not be below 8% (some say 10%) for a bank to be considered to have sufficient capital. Members can search for banks with a specific capital adequacy ratio by using the Advanced Search feature inside of BankProspector. The danger in prospecting banks that have an insufficient capital adequacy ratio is that you may well be wasting your time. Banks have balance sheets and the assets that they hold are on these balance sheets at their last appraised value. If that appraised value is above what the real market value is for the property (as is all too often the case) then a disposition at a market rate could adversely affect them. In many cases when a bank is severely under capitalized they will work to bring in deposits, merge with another bank, and/or enter into extended or creative workout negotiations with delinquent debtors. The Leverage Ratio minimum is 3%.